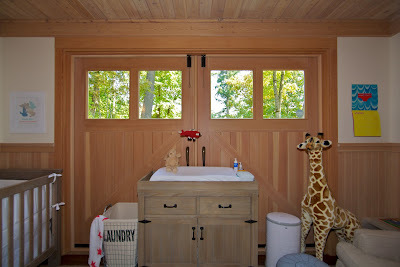 An avid reader of Nursery Notations sent me some photos of her "summer" nursery a few weeks ago. The family used to live in Manhattan Beach (we ran into each other a block from my house one day when she was pregnant and she called me out after seeing photos of me and my family on the site) and they spent the summer in the Washington mountains. Now they just moved to Marin, California. 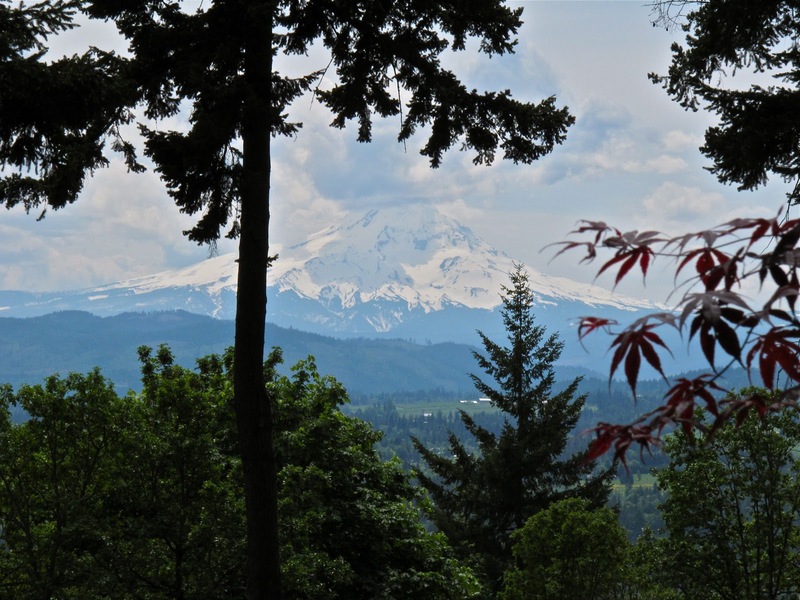 Seriously look at the view from their yard! 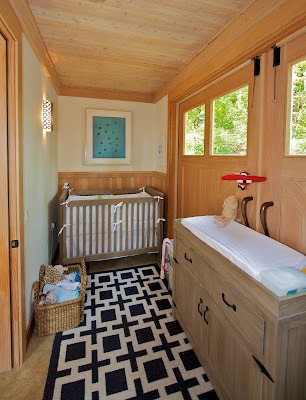 Anyways, I wanted to share this space with you all because she did a wonderful job creating a comfortable and stylish nursery in a tiny space. 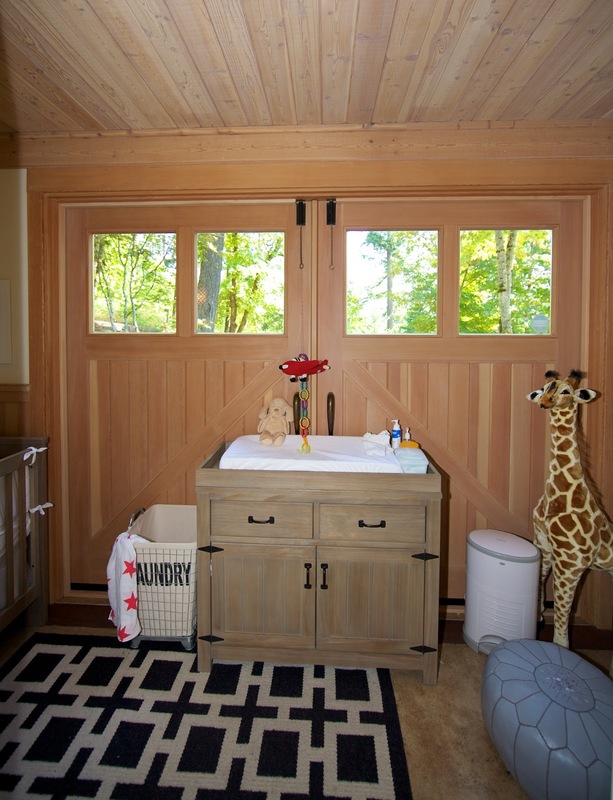 The room is only 52" wide (the width of a crib). For those of you with one child already, you know that in the early months they don't need much space. Just a quiet and serene place to call their own. The photo above is what you see when you walk into the room. Turn left and you see the crib (below). The crib & dresser are from Kenwood Collection by Restoration Hardware Baby & Child and the rug & sconces are by Jonathan Adler. Turn right (below) and you have your nursing and reading nook. The pouf is from Serena & Lily and the giraffe is by Melissa & Doug.The blue & orange artwork pieces are from her friend's gallery in NYC. Lastly here is a photo of William, the adorable boy who lived in this room all summer. I can't wait to see photos of his new home next! Thank you for sharing Nashara! 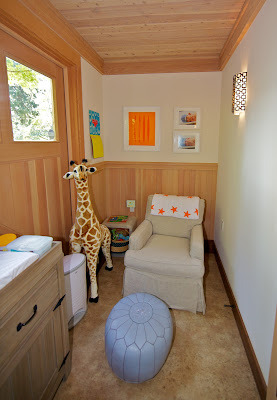 this nursery is so cozy and he will be able to use it for years...even teens like cozy spaces!